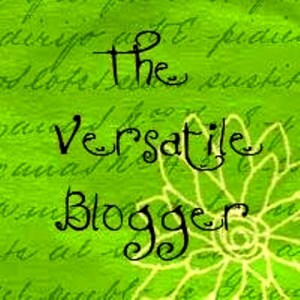 Web Presence: At Pawalla.com, Facebook, etc. The folks at Pawalla.com are pretty good to the Bows. 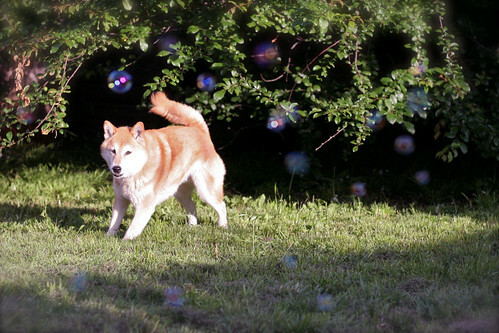 In fact, that’s what the company is set up to do — pamper your pets. 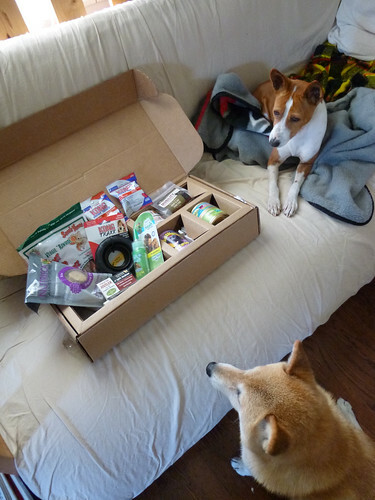 They recently came up with a more compact version of their monthly subscription box of “all-natural or organic” dog and cat goodies, and sent us a complimentary box in exchange for a review. This was also a good opportunity to see how far they’ve come since we reviewed their full service kits back in July 2012. Silly to me, but it was indeed unexpected. And the whole point of the Pawalla box is to offer a variety of surprises with the expectation that there will be enough novelty in each box to make the deal worthwhile. So that one dud aside, how’d they do? 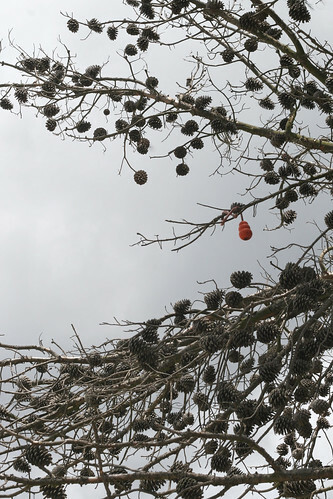 The Bows, as usual, showed greatest interest in everything edible. It was pointed out to me that the above picture makes the Grizzly Salmon NuTreats look like something I picked up on a morning walk. They’re actually quite appetizing, crunchy bites! 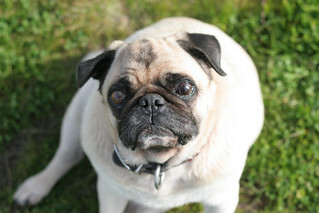 We mainly know Grizzly Pet Products as a trusted brand in salmon oil supplements. Nice to know they make a training-sized treat with simple ingredients, as well. 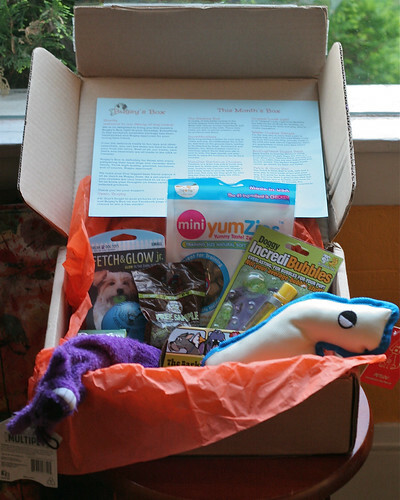 The “star” of this box was Wigzi, a Washington, D.C.-based pet product company. 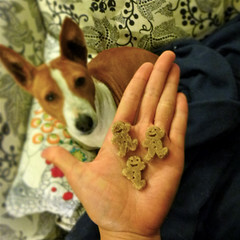 Their Tasties treats are grain and wheat-free, made instead with chick pea and tapioca flour. We got the roasted duck variety (other possible flavors include peanut butter and Wisconsin cheddar), which were eagerly gobbled as one of the “forbidden flavors” not typically fed at the House of Two Bows. 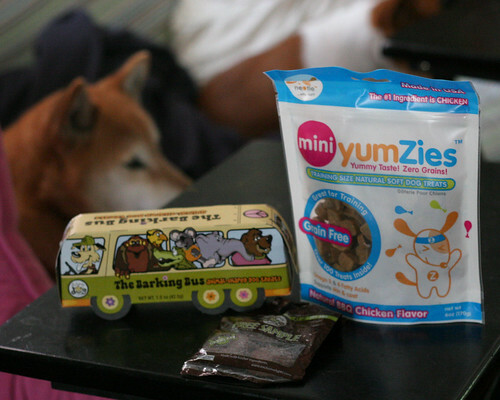 The treats, however, are just a bit too crumbly to insert into the company’s own Lock ‘n’ Play chew toy with a treat pouch, which otherwise serves as an interesting alternative to typical rubber chew toys. 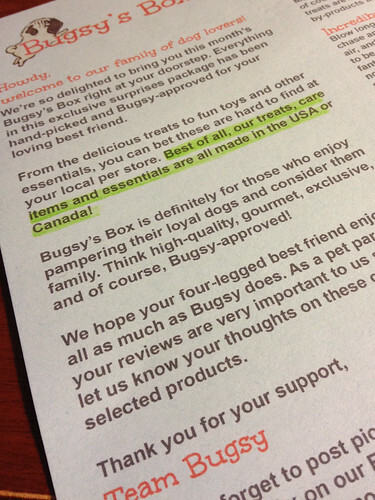 Wigzi toys are all made in the U.S. (a rare find in non-edible pet products!) from some special “advanced material… [that] has zero BPAs or Phthalates, uses FDA approved material and is also recyclable.” If an object could glow with pride from being manufactured under superior conditions, I suppose this toy would do just that. 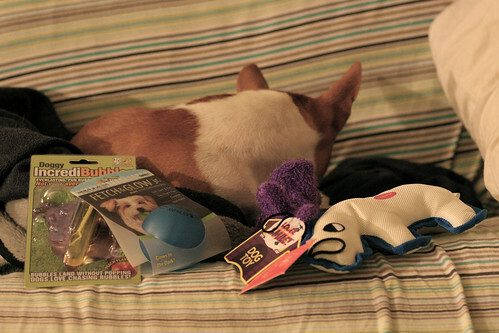 Personally, the Bows have limited interest in toys. The few we keep around are usually functional and interactive, as this one is. 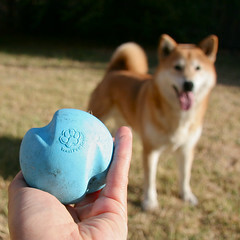 Too bad we don’t have a heavy chewer around to test its durability, but it does look — and smell! — unique. 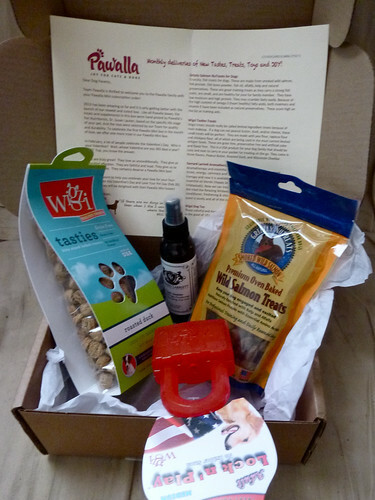 Overall, the Pawalla Mini box looks promising if you know you’re going to spend at least $12 per month indulging your pets with extras. No wet foods or “main course” meals are included with Mini boxes, so it’s a good option for those who already have fairly set menus (perhaps cat owners? 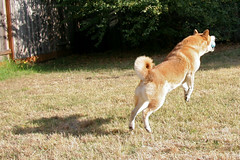 ), and prefer to explore other, supplemental offerings. 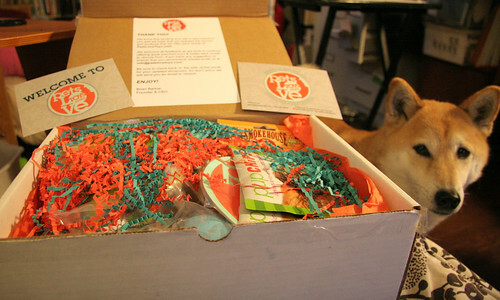 In this particular box, we really only made use of the treats, which I feel just barely makes it a $12 value — the lowest price per box for a 12 month subscription at Pawalla’s new tiered pricing scheme. 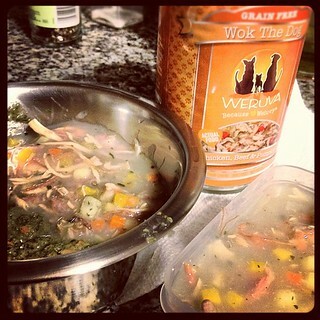 At $14 a month for a six month subscription, my pet(s) better be inclined to enjoy both food and toys. At $17 a box for a one-time affair, we’d better be sure to love everything, and honestly, that wasn’t the case with this box. 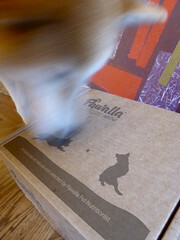 Like the full-sized Pawalla box, the edibles here were all corn and wheat-free, with no artificial colors or flavors. 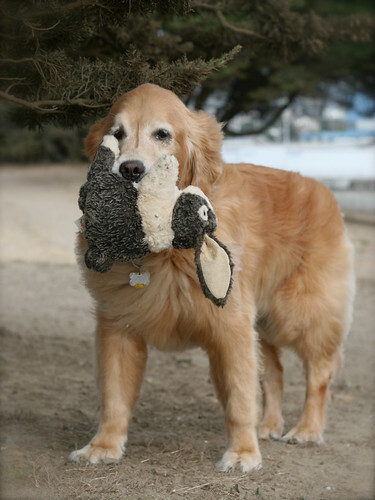 Having a certified pet nutritionist on board is reassuring, but more importantly, Pawalla cares to maintain consistent high standards. This would make an awesome “puppy-warming” gift for a new pet with no protein allergies who might still be exploring their taste preferences. New subscribers can knock $5 off their first box with our referral code; otherwise, it’s most cost efficient to just spring for a six or twelve-month subscription. Cutest couple spotted at the dog park today — Ingrid and her rabbit. I never saw her drop that rabbit for even a moment. While normally I am opposed to the idea of dogs bringing along their most prized possession to the dog park, this is an exception. 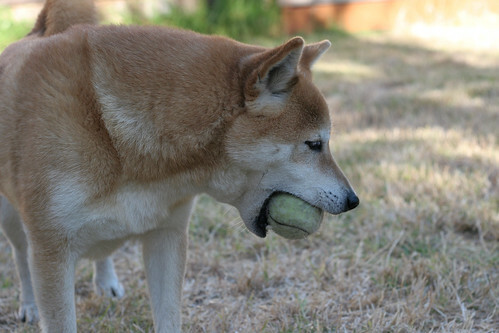 Nobody had an opportunity to steal it and make a scene (rarely do I see another dog try to force an object out of another dog’s mouth unless they’re clearly playing tug), and she displayed no possessiveness. I guess Ingrid just wanted her rabbit to enjoy some fresh air, too! 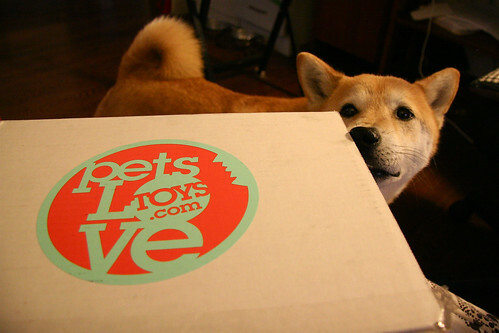 Web Presence: At PetsLoveToys.com, on Facebook, Twitter, etc. 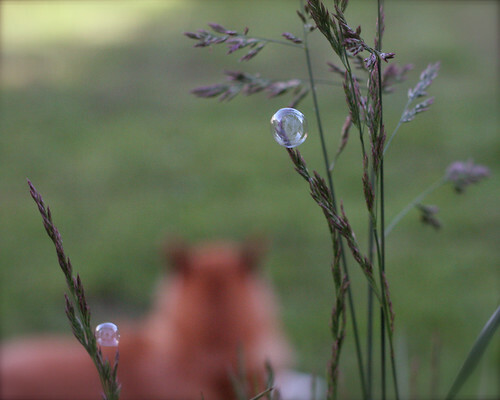 If you’re looking for another way to mark the passing of time (something I’m all too keenly aware of lately), consider signing up for a pet subscription box. 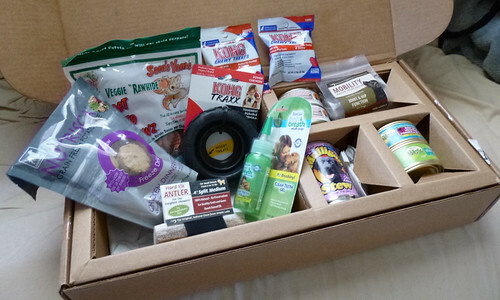 No, not gerbils and kittens delivered via USPS, but rather, a monthly batch of goodies for your pet(s) delivered straight to your doorstep. We’ve only recently heard about this crazy concept to maximize our potential to live amongst the MOST SPOILED PETS in the world. At the very least, this should change the stereotypical relationship between dogs and mailmen for the better, right? 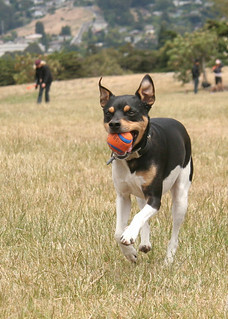 Spreadin’ the love is what PetsLoveToys.com seems to be about. 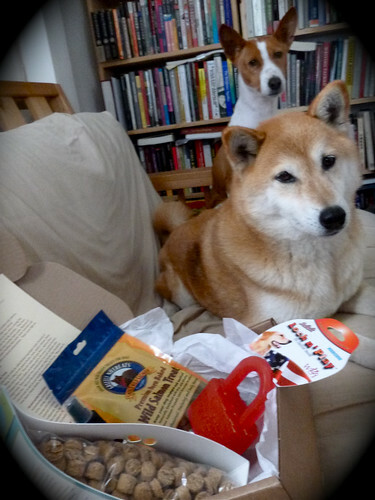 We were very excited that they wanted to send the House of Two Bows a big ol’ box of goodies for review. Their regular ordering cycle works as follows: On the 25th of every month, a new showroom, or gallery of available choices, is revealed to subscribers. 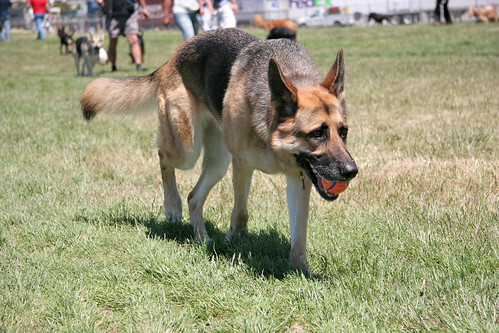 You’re presented with three rows of options for your two main units (seems to be 2 – 4 items total), depending on if your pet enjoys toys, treats and chews, or toys and treats. Members have until the first of the month to make a selection, or skip the month and see what else comes up next time. When choices are made, boxes go out, starting from the first of the month. Note that this is how much you would get in two boxes for small-medium dogs. Of course, Bowdu thought it was all for him, so I let him take command of the inspections. I don’t blame him for not wanting to look the garish neon orange squirrel in the eyes. That thing looks like it’s just asking for its face to be gnawed off. 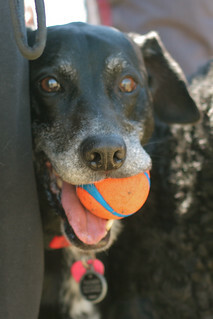 As expected, he showed much more interest in the ZOGOflex ball. Whenever he gets a new action toy (like a ball or tug rope/stick), he’s always torn between guarding it or letting the humans in on the game. After spending a few private moments dirtying up HIS toy, he finally decided to share and let me play with it too. It’s a very nice ball. Toys in this line feature unusual shapes and durable material, and they’re manufactured in Montana — a state that is thoroughly familiar with dogs and all kinds of exciting wild critters, as I hear. 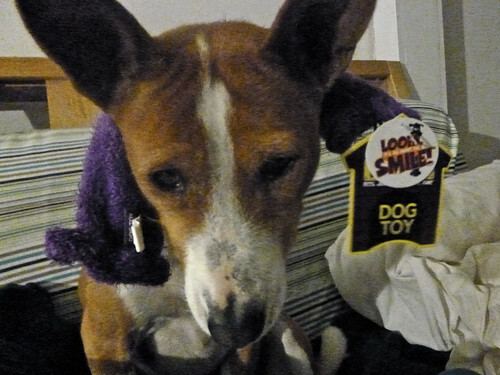 Good to see they know how to make a sweet dog toy, too! 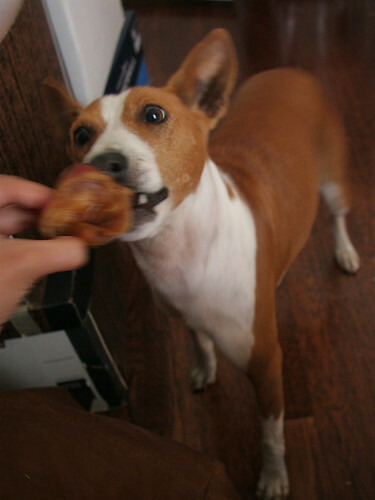 … and both dogs proceeded to make a glorious, crunchy mess in their respective spots as they chomped up their pig ear parts. 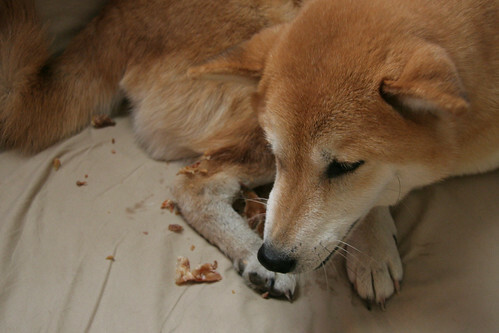 No worries — they took care of the crumbs, too. 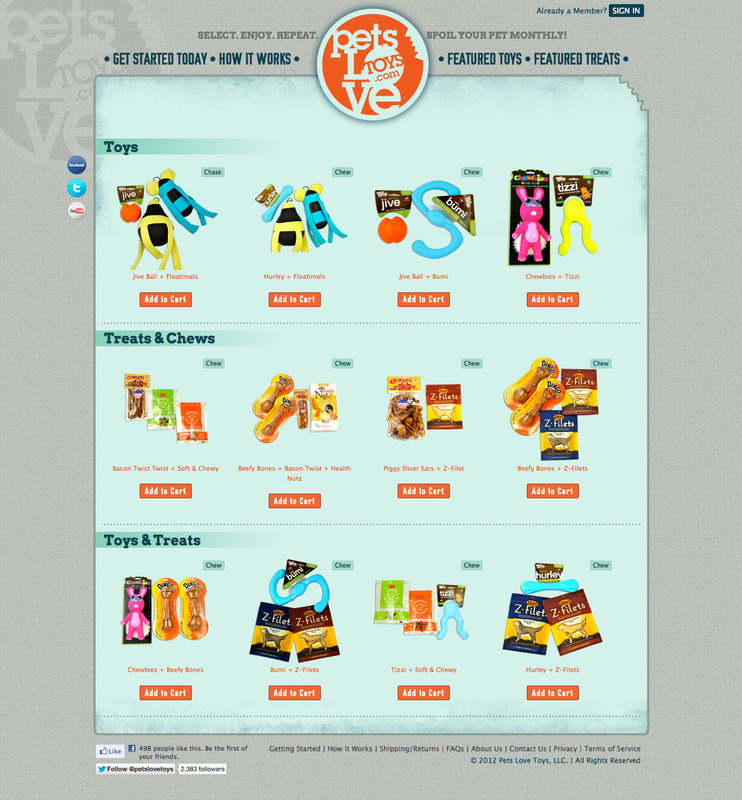 Value wise, you will come out a little on top with savings by ordering through PetsLoveToys. Under normal circumstances, we would have paid $28.40, shipping included, for these two portions. 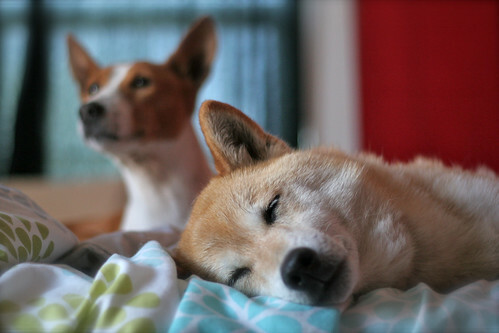 A single Shibasenji-sized subscription would be $14.95, and each additional box comes at another 10% discount, up to three pets total (so 10% off for the second pet, 20% off for the third). A quick tabulation of Amazon and/or local retail prices on these items puts me at approximately $36 or $37 dollars for the whole lot, if I were to buy them separately. However, I probably would not have chosen to purchase a couple of these items. 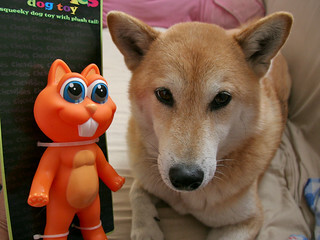 Upon closer inspection, the scary neon orange squirrel toy was made in China. 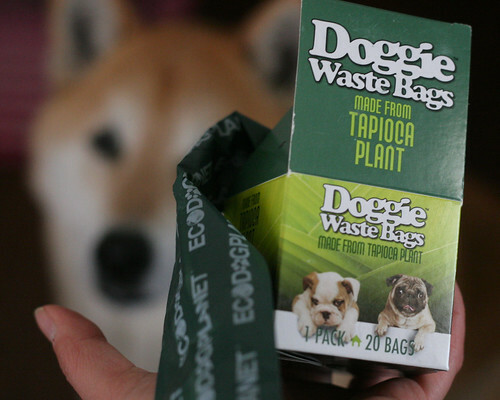 If it goes in my dogs’ mouths or can be ingested, I don’t want it coming from Chinese manufacturing plants (and I say this as someone with relatives that once owned and operated a pet toy manufacturing plant in China). Brian, the company owner, acknowledged my concern and said that this is something that the company will work to address as they continue to discover more domestic companies that offer good products at fair prices. 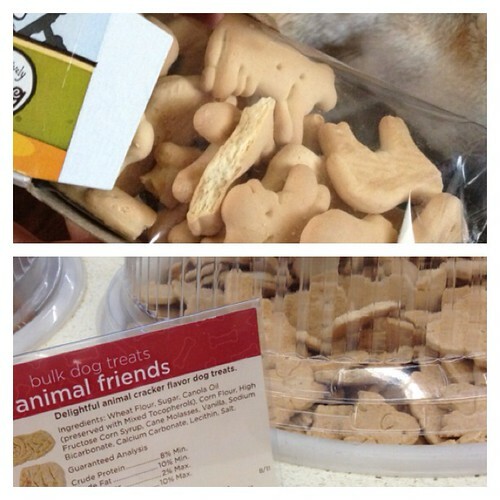 This shouldn’t be an issue with edible items, but apparently it’s trickier with pet toys. 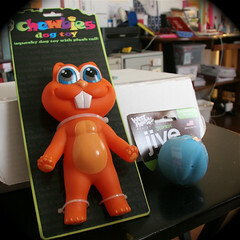 An ultimate goal is for the company to manufacture its own US-made toys. It sounds ambitious, but I hope they can meet their goal! 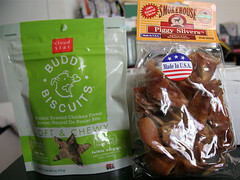 We know Cloud Star soft and chewy Buddy Biscuits have quality ingredients, but since we do not usually feed processed beef or chicken flavors, this product was a borderline case for us… though I’ve been letting up on this household rule lately. Anyway, I have purchased this brand in stores when I found them in alternate flavors, and both Bows found this month’s selection quite gobbleable. They especially liked the pumpkin-flavored samples. That’s something we would anticipate in future showrooms. Meanwhile, Brian assured me that the company is looking into novel protein options for dogs who display sensitivities to common meats found in typical pet foods and treats. Normal subscribers can return unsatisfactory items for exchange or credit (they cover shipping) — otherwise, returns are charged a $5.95 restocking fee. Really, I can’t complain much, since I chose the items myself. That’s the most important thing about this subscription service — you’re always given a choice in what you get (or you can skip a month and wait until the next showcase), and it shouldn’t be be a box full of unwanted surprises. Of course, the freebies and extras are nice too, but here, your preferences matter. 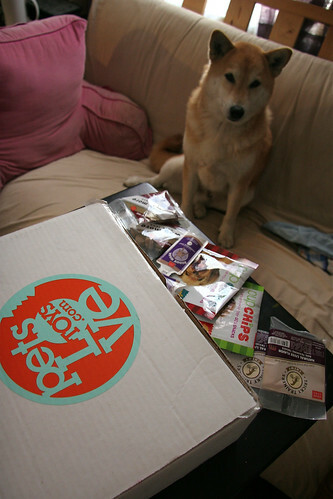 Overall, PetsLoveToys.com appears to offer the most inexpensive subscription box of several similar services that have popped up in recent months. 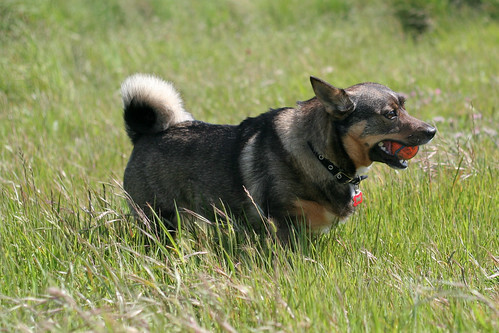 Others that we have surveyed typically cost over $20 per month, so PetsLoveToys undercuts them all, specifically for smaller dogs. The quantity of items included are fairly conservative, and might be insufficient for more active, destructive, gluttonous, or picky members, but that is counterbalanced by the slight deal you get. Bottom line: The Bows were happy with what they got! And the company seem quite open to receiving feedback, constructive criticism, and suggestions for improvement, so it’s worth keeping an eye on Pets Love Toys, especially as they roll out more variety, more options, and hopefully other species-specific deals… like something for cats? Well… they can party with the packaging paper and box. 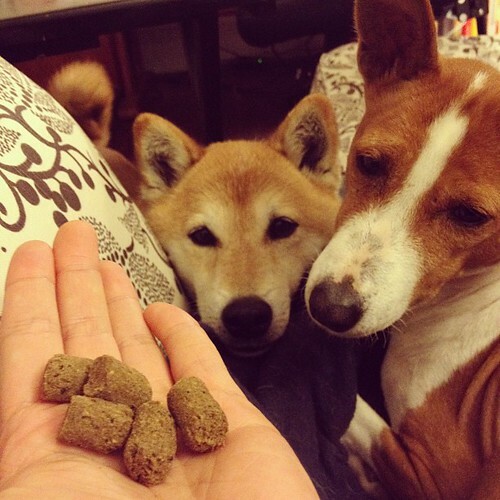 Dogs get dibs on the good stuff. … I can’t help but cue The Supremes in my head. Lyrics are only slightly related. Anyway, we’re taking it easy this Fourth of July. It’s a fairly low-key holiday here at the House of Two Bows. And that’s how we’d like to keep it.